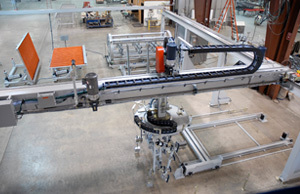 Stone Countertop Automation Equipment for the Kitchen and Bath Industries – Creative Automation, Inc. 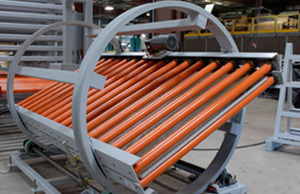 Following are a few Creative Automation solutions for the growing stone countertop industry. 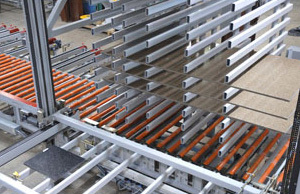 After installation, this server-controlled stone storage/retrieval system is over 150 feet long and has over 70 A-frame storage locations for sheets of stone. 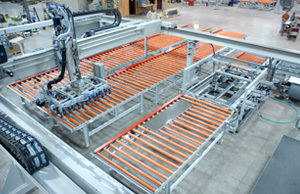 Server-controlled gantry pick and place loads and unloads stone to/from an existing saw/water jet. Also included is a custom designed rodding saw. Accumulator stores countertops and retrieves them when called for by the customer's server. Barrel turnover inverts stone countertops.